Free shipping for orders over US$ 150. We don’t ship to PO Boxes, APO/FPO. Please check if your country is included in our drop down list during check out. If not, please contact us and we will work on shipping to your country. We operate from Monday to Friday. Any orders and payment confirmations received on weekend or public holidays will be processed on the earliest business day. Allow 1 (one) day after payment confirmation for us to do QC, pack your order, and deliver it to the shipping company. You will receive a confirmation email with a tracking number once your order has been dispatched. All ready stock orders will be dispatched within 3x24 hours. However, deliveries may sometimes take longer during festive seasons of public holiday. We will send a notification should this occur. Please allow 1-5 working days depending on the area. 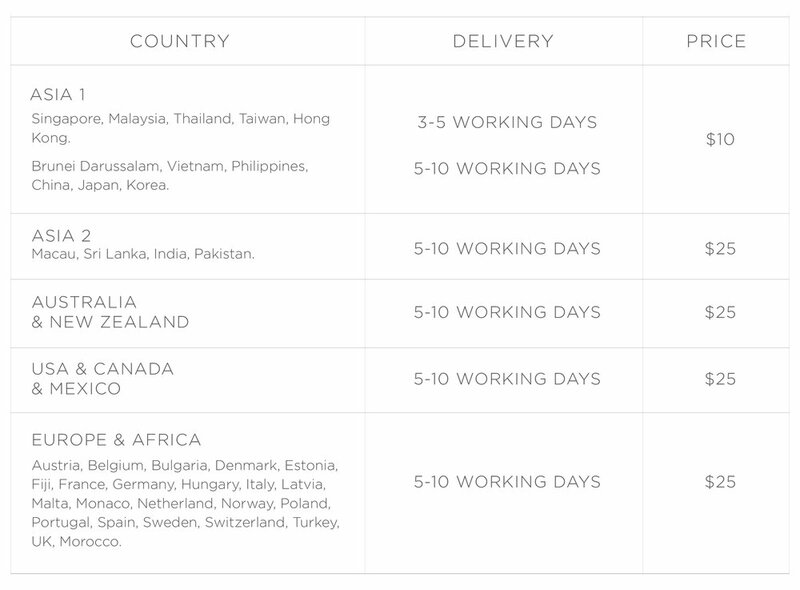 We partner with different shipping companies to ship internationally. Our couriers do not ship to P.O boxes. We are not responsible for any loss or damage after the courier has delivered the packages to the designated address. We do not take responsibility if the courier cannot deliver the package in time due to incomplete address, misspelled address, or no recipient at the address. If there is any shipping or packaging mistake, we are responsible and will give free shipping to the customer. We are not responsible for any additional taxes and duties charged. VINN has no control over these charges and we could not tell you what the cost would be, as customs policies and import duties vary widely from country to country. Once your order has been shipped, you will receive an automated confirmation email with your tracking information. We accept return and exchange request within 7 (seven) days after you receive your order through email at contact@vinn.store. Please allow 24 hours for us to respond to your request. After receiving our email confirmation, please send your items back to us within 7 (seven) days to the return address. All returned items should be sent back clean and unworn with their original tags and packaging intact. We are only able to offer size exchange of the same style or exchange for items with manufacturing defects. You can only make one-time exchange for one item. All exchanges are subject to stock availability. If the item or size you want is no longer available, we may refund you with a voucher code with no expiration date, which can be used at our website. We do not accept any return and exchange for products in white. We cannot accept any return and exchange request made after our seven-day policy.